Above: A street sign marking the road made famous in The Beatles' 1967 hit song. 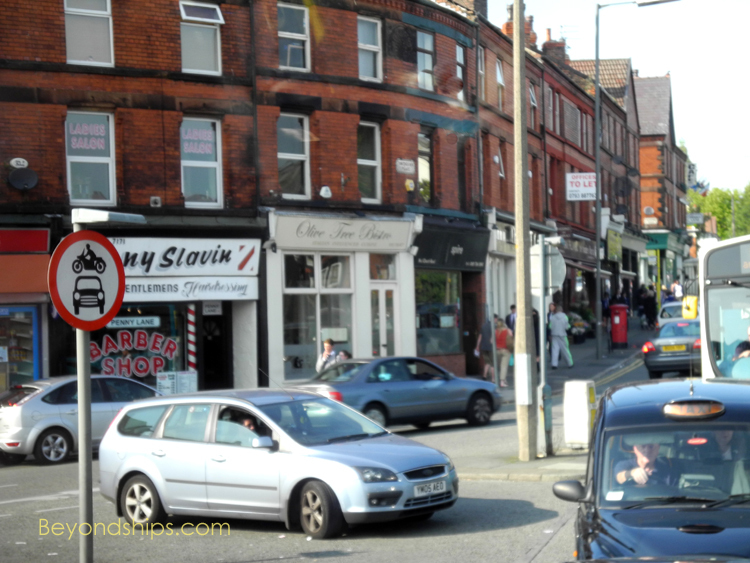 Below: The roundabout on Penny Lane including the bank and the barber shop mentioned in the song. 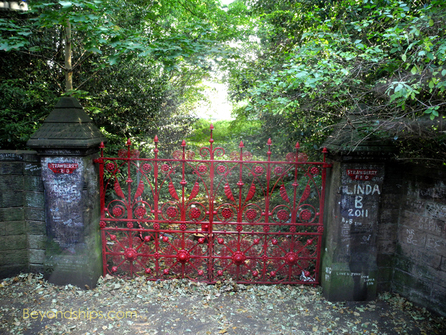 Above: The gate at Strawberry Field. 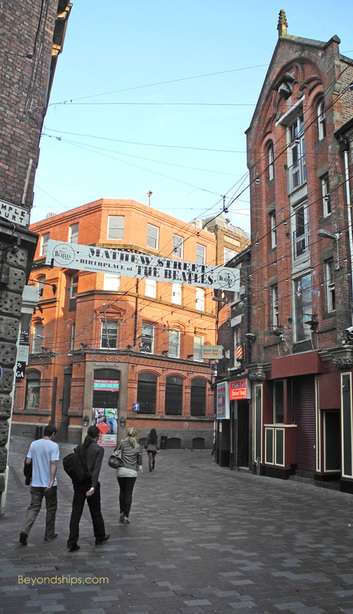 Above: Mathew Street in downtown Liverpool where The Cavern Club is located. 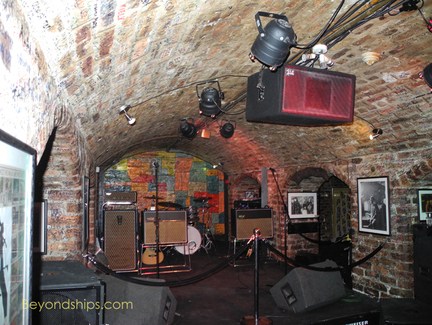 The Beatles performed numerous times at The Cavern. The Cavern Club was demolished in the early 1970s for a public works project that was never completed. Below: The entrance to the original club. 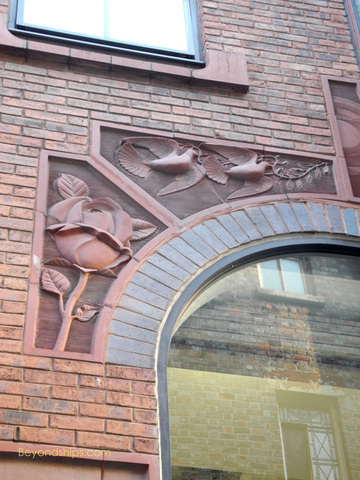 Above: The building that was eventually built over the site of the original Cavern Club is decorated with reliefs that were designed by Cynthia Lennon, John's first wife. The doves are an allusion to John's work for world peace and the rose was one of his favorite flowers. 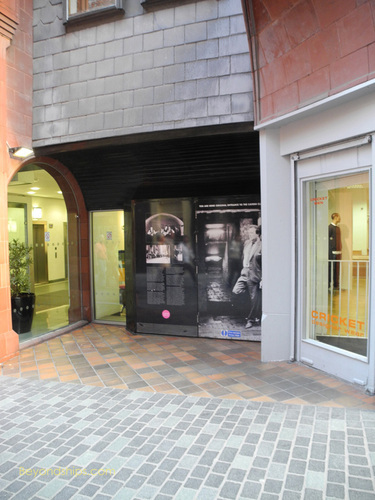 Above: The entrance to the Cavern Club at its new location. Below: The interior of the new Club was built using bricks from the original club and was designed to resemble the original as closely as possible. 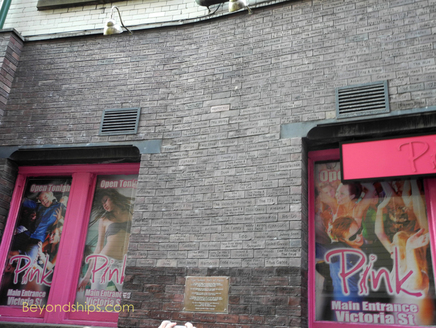 Above: The Cavern Wall of Fame opposite the Club on Mathew Street. Near the two boyhood homes are two places that have been immortalized in song. After the group achieved success, all of the Beatles moved to London. However, a single issued in early 1967 demonstrated that they had not forgotten where they grew up. McCartney's "Penny Lane" presents a montage of summer time memories from a suburban street near where he lived. 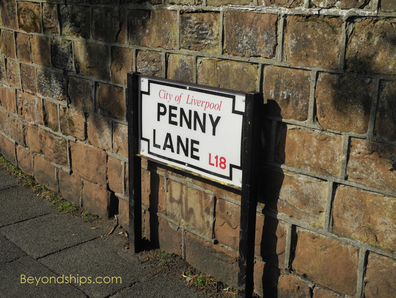 Tour buses stop along a park-like stretch of Penny Lane to allow the passengers to take pictures of, and pose by, a street sign without disrupting the flow of traffic. However, further along the road in a busier, more developed section you come to an intersection. 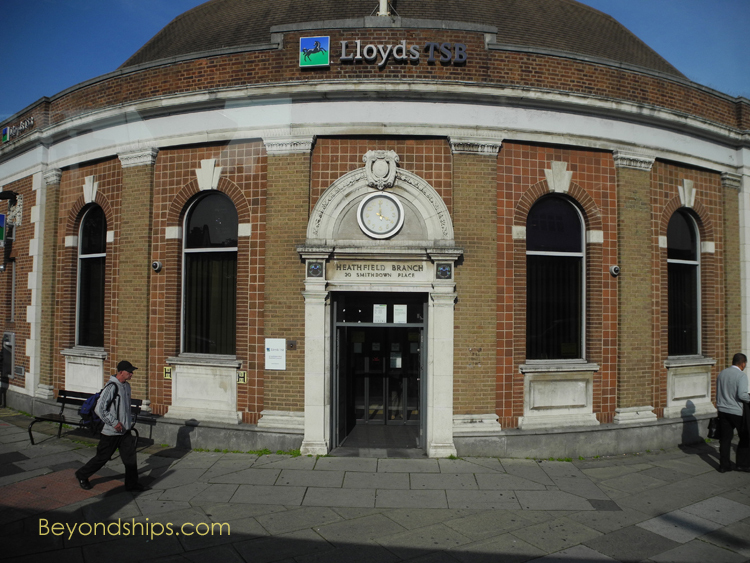 There, you find the barber shop, the bank, and the bus shelter mentioned in the song. Strawberry Field was a Salvation Army children's home. In its grounds were green areas where local children used to play. John Lennon was particularly fond of the annual garden party held there each summer, which he attended with his aunt. Recalling that island of happiness, he added an "s" to the name and chanted "Strawberry Fields forever" in the refrain of his brooding yet poignant song about confusion and loneliness. The old house that was the children's home was torn down in the 1970s and the facility closed altogether in 2005. Not longer after, the Victorian cast iron gates were removed and replaced by replicas. Today, the Strawberry Field site is along a wooded stretch of road. The gates stand in isolation with the stone pillars that support the gates marred by graffiti. It is a lonely spot. 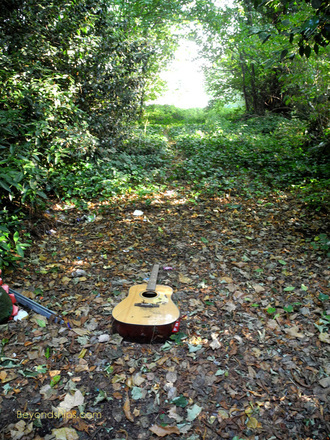 When I was there, someone had placed an old acoustic guitar on the path leading through the woods beyond the gate - - heartbreakingly sad. Our tour did not take us to the childhood homes of George Harrison or Ringo Starr. The guide told us that both Harrison and Starr had grown up in more inner city/ working class parts of Liverpool. Harrison's birthplace (the family moved several times) is still a private home, not open to the public. Ringo's house on Madryn Street was slated for demolition as part of an urban renewal project. We drove back into the city to visit the Cavern Club, the place where the Beatles first achieved real popularity. The first time the group appeared there was on 9 February 1961 and it went on to perform there 292 times. Hearing of a band that was causing a sensation amongst Liverpool's young people, local record store owner Brian Epstein went to the Cavern to see The Beatles in November 1961. Impressed by the potential that he saw, Epstein offered to become the group's manager. He re-cast the group's image from that of leather-clad rockers to a more polished look that would become world famous. More importantly, he was able to secure the band a recording contract. With the outbreak of Beatlemania, the Cavern Club had an international reputation. This was buoyed by a string of other British Invasion stars who also received their start at the Cavern. The original Cavern Club was in the cellar of an old warehouse building on Mathew Street. In the early 1970s, the warehouse was demolished in order to build a ventilation shaft for an underground railroad system. The cellar where The Beatles had performed was filled in with rubble. The Cavern Club re-opened at a location across the street but the venture was financially unsuccessful. In the 1980s, plans were formed to excavate the original Cavern Club cellar and re-open the club at its original location. However, it was found that the cellar was no longer structurally sound. So, bricks from the original cellar were used to re-create as closely as possible the Cavern Club next to its original location. Unfortunately, this venture was also financially unsuccessful. The Cavern Club re-opened under new management in 1991, combining Beatles era tributes with performances by contemporary groups. Subsequently, a number of major stars have performed there including Paul McCartney. Mathew Street has changed since The Beatles performed at the Cavern. It is now pedestrians only and it is clearly aware of its status as a tourist attraction. Opposite the entrance to the Cavern Club is the Cavern Wall of Fame with the name of a band that played at the Cavern engraved on each brick. A banner flying over the street proclaimed that it is the birthplace of The Beatles. 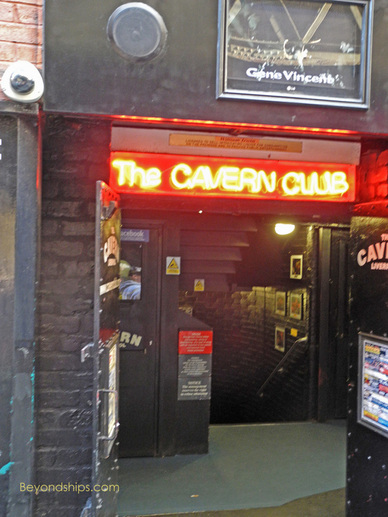 To get to the Cavern Club, you have to descend a long flight of stairs from the street level entrance. At the bottom, the room is dominated by brick arches. At one end of the "Front Room" is a small bandstand, which looks like the one in the photos of the Beatles playing at the original club. On the opposite side is a bar and in between are small tables and chairs. It is not a large room and it would not take many people to fill it. However, there must have been a tremendous amount of energy created when The Beatles and other legendary bands played to a house packed shoulder-to-shoulder. The Cavern offers live music every day from mid-afternoon until late evening. There is no admission charge in the afternoons but there is a charge for certain evening performances. During the course of the tour, our guide pointed out numerous other places with a connection to one or more of the Beatles - - schools they attended, the bus line that Paul McCartney and George Harrison used to take, the cathderal that rejected Paul’s application to join the choir etc. These things helped to color in the picture. But in the end, I was impressed most by how such ordinary beginnings led to such extraordinary lives. There were no grand houses, exceptional institutions, advanced schools or ground-breaking technology on this tour. Nor was there extreme poverty to be seen. Instead, the things we saw were very average, not unlike those experienced by thousands if not millions of others. Yet, with talent and hard work, these four individuals went from Liverpool on an amazing journey that took them all over the world and brought riches, fame, influence, love and sadly, in some instances, tragedy.